It's reader like you that make this possible. If you find our recruiting content at Verified Athletics valuable, there are many ways you can support it. You can share it on social media with your friends, you can blog about it or discuss it on your own media platforms, or you can support it directly by visiting and donating at our Patreon page: https://www.patreon.com/verifiedathletics. Thank you for your support of our project to provide the best recruiting content free of charge. It is important for families to understand what to expect from college one-day prospect camps so they can make informed decisions on where to spend their time and money. We’ve surveyed hundreds of college coaches across all collegiate divisions to better understand the dynamics of one-day prospect camps. How Do You Know If a School Is Really Recruiting You? Unfortunately some recruiting communication can be deceiving, and not a good indicator of a future offer. To an untrained eye, it is hard to distinguish between genuine interest and a generic reach-out. We’ve spoken to hundreds of coaches and our coaching advisory board in order to give you the best recruiting tips. Here are our expert tips to make your highlight tape stand out. Most college bound athletes, especially in the summer between their junior and senior year, get invitations to one-day prospect camps from various college programs. It is impossible to attend them all and picking more than a couple can be expensive and time-consuming. It is important for families to understand what to expect from college one-day prospect camps so they can make informed decisions on where to spend their time and money. We’ve surveyed hundreds of college coaches across all collegiate divisions to better understand the dynamics of one-day prospect camps. Our survey found that the majority (65%) of colleges invite all of the athletes on their mailing list to their camps, with 35% of programs focusing on athletes that have a shot at a roster spot/scholarship. The focus on roster spot/scholarship athletes increases at the D1 level to 44%. This means that you are likely getting dozens of camp invitations from schools that are not actually interested in recruiting you. Most coaches surveyed (85%) told us that they look at the rising seniors class at their camp. Division 1 FBS programs split their attention between rising seniors, juniors and sophomores. It’s important to note that FBS schools from major conferences told us that they focus on Sophomores and Juniors. The rest of the collegiate divisions (D1 FCS, D2, D3, NAIA, Juco) focus almost exclusively on rising seniors (94%). 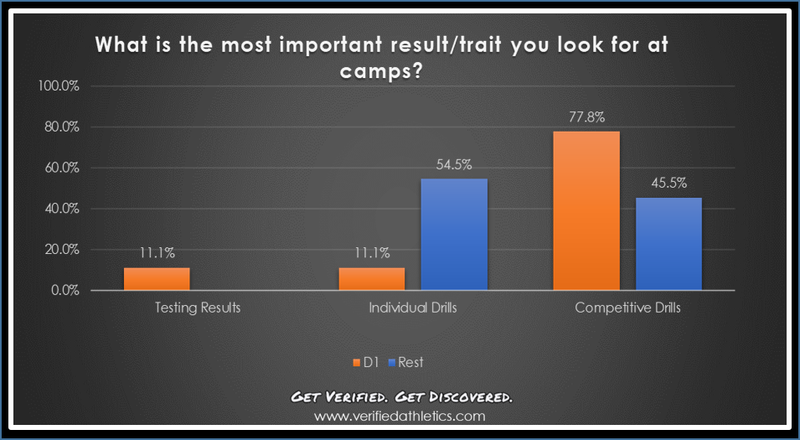 Our data shows that while at camp, coaches mostly focus on individual and competitive drills. The emphasis on these two types of drills differs between divisions, with 78% of D1 coaches telling us that the competitive drills were the most important, while other coaches are split between individual drills and competitive drills. The question most athletes want an answer to is: Can attending a college prospect camp help me earn a scholarship? Our survey indicates that college programs overall are split on how an athlete’s performance at a camp impacts scholarship offers. Our data shows that 30% of programs will make an offer based on a great camp performance alone, 30% of programs will make an offer only if the film is also good, and 30% of the programs say that the camp performance only matters a little, and they mostly look at in-game performance. If you are attending a D1 camp there is a higher chance that you can get an offer based on a performance at the camp. 44% of D1 schools told us that they will make an offer based on camp performance alone and 33% will make an offer if the film is also good. APPLY HERE TO JOIN THE VERIFIED ATHLETICS WATCH LIST, WHERE COLLEGE FOOTBALL COACHES GO TO DISCOVER, WATCH, AND EVALUATE HIGH SCHOOL ATHLETES. While most schools won’t offer based on a good camp performance alone, attending prospect camps at D1 schools is really important to jump from being just on the board to a scholarship offer. 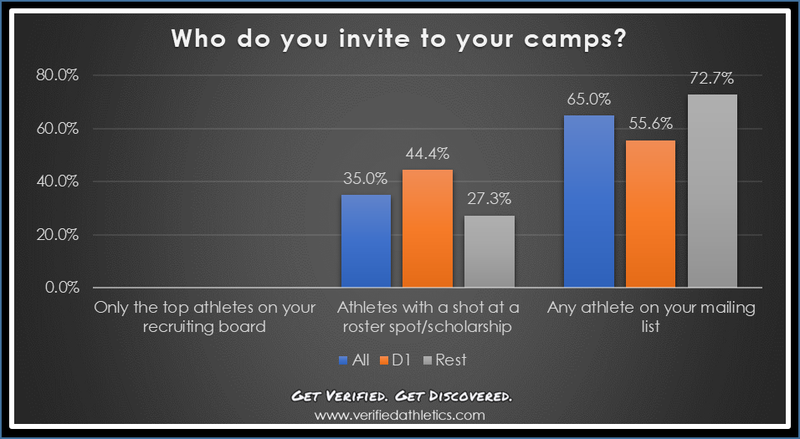 Our data shows that between 50% and 75% of D1 scholarship offers go to athletes who attend their prospect camp. Schools from other divisions focus on in-game performance and only 25% of their team roster/scholarship offers to to athletes who attend camp. If you receive an invitation to a one-day prospect camp from a school it does not mean that the school is actively recruiting you. Most schools send invitations to all of the athletes on their mailing lists. If you are looking for offers from major conference D1 schools (Big 10, Big 12, SEC, ACC, PAC12), you should target those camps as a rising sophomore or junior. If you are already entering your senior year, you should be targeting smaller D1 schools (small conference FBS and FCS). Attending camps at schools from other divisions is great to develop skills and learn about the school and coaches, but it is not necessary to get an offer or roster spot. See a breakdown of different divisions HERE. Chose camps at schools that are actively recruiting you. Most D1 schools use camps to evaluate athletes already on their recruiting board and decide who to offer a scholarship to. If you attend a camp for a school that is not recruiting you, you are just paying for the coaching and likely will not get a serious evaluation. To learn more about how to know if a school is actually recruiting you, read our article by clicking HERE. If you are not being actively recruited by any schools, we suggest going to the schools you are most interested in at a variety of different division levels. This will help you understand what you like about different schools and divisions. This way you are prepared when you need to make a decision. Hopefully, it also attracts the attention of coaches at the camp and you can figure out what schools will be most likely to recruit you.